The 2012 Chrysler 200 Convertible is unique in the standard specialty segment as a true mid-sized convertible that comfortably seats 4 adults and has room in the trunk, even when the power top is dropped. Consumers can choose from two automatically latching, power tops, a body-color painted steel, retractable hard top, or a cloth soft top, both of which can drop with the press of a button on the key fob. New for 2012, the Chrysler 200 Convertible sports two new exterior colors: Crystal Blue Pearl Coat and Deep Auburn, and a new interior color scheme for the Limited model: Black with Pearl White. For 2012, the Chrysler 200 Convertible offers consumers a fun, open-air driving experience featuring elegant craftsmanship inside and out, an extraordinary level of standard content and innovative technology at a price that is pleasing to the wallet. The Chrysler 200 Convertible is an exciting alternative for customers who want the benefits of a coupe and the true open-air freedom of a convertible, all at a surprising value. New for 2012, the Chrysler 200 Convertible sports two new exterior colors: Crystal Blue Pearl Coat and Deep Auburn, and a new interior color scheme for the Limited model: Black with Pearl White. The 2012 Chrysler 200 Convertible is unique in the standard specialty segment as a true mid-sized convertible that comfortably seats 4 adults and has room in the trunk, even when the power top is dropped. Consumers can choose from two automatically latching, power tops, a body-color painted steel, retractable hard top, or a cloth soft top, both of which can drop with the press of a button on the key fob. With clean, sleek lines, the signature Chrysler grille and winged badge, LED light pipe accents in the front projector headlamps, LED taillamps, a well-crafted interior including a one-piece instrument panel, “soft-touch” armrests and instrument panel and premium touch points throughout the vehicle, the 2012 Chrysler 200 Convertible delivers a design with purpose and attainable luxury. The 2012 Chrysler 200 Convertible provides drivers a fun, confident, handling performance in all driving situations, whether it’s commuting to work or a weekend adventure on scenic roads. The 2012 Chrysler 200 Convertible offers the choice of two powertrains, the 3.6-liter Pentastar V-6 engine which provides outstanding V-6 horsepower and exceptional fuel economy or the proven 2.4-liter World Gas Engine. Both are mated to the 62TE six-speed automatic transmission. The 3.6-liter Pentastar V-6 engine produces 283 horsepower (211 kW) and 260 lb.-ft. (353 Nm) of torque and has an estimated U.S. EPA fuel economy rating of 19 miles per gallon (mpg) city and 29 mpg highway. The 2.4-liter I-4 World Gas Engine produces 173 horsepower (129 kW) and 166 lb.-ft. (225 N•m) of torque and has an EPA fuel economy rating of 18 mpg city and 29 mpg highway. The 200 Convertible has a 5-year, 100,000-mile powertrain warranty, and every available safety feature is standard on every model. The 2012 Chrysler 200 Convertible is available in three different configurations in the United States – the Chrysler 200 Convertible Touring model, 200 Convertible Limited model and the 200 Convertible S model. All are packed with style, safety, an exceptional level of standard content, innovative features and a dynamic, open-air driving experience at a surprising value. The Chrysler 200 Convertible Touring model has a starting U.S. Manufacturer’s Suggested Retail Price (MSRP) of $26,575 excluding $750 destination and is powered by the 2.4-liter I-4 World Gas Engine mated to the 62TE six-speed automatic transmission. Standard equipment includes: power cloth top, advanced multistage driver and front passenger air bags, supplemental front-seat mounted driver and passenger air bags, active head restraints, four-wheel anti-lock disc brakes, electronic stability control, traction control, Sentry Key® engine immobilizer, illuminated keyless entry, security alarm, speed control, power locks, power windows, power top down via the key fob, rear window defroster, power trunk lid release, acoustic laminated front windshield glass, Electronic Vehicle Information Center (EVIC), universal garage door opener, bi-functional halogen headlamps, automatic headlamps with turn off time delay, power heated exterior mirrors, 17-inch aluminum wheels, automatic temperature control, six-way power driver and front passenger seats, Media Center 130 CD/MP3 radio, steering-wheel-mounted audio controls, leather-wrapped steering wheel, leather-wrapped shift knob with chrome accent, tilt/telescoping steering column, ambient LED interior lighting and premium cloth seats. The 2012 Chrysler 200 Convertible Limited model offer the standard features the Touring model offers as well as: 3.6-liter Pentastar V-6 engine, dual bright exhaust tips, leather seats, Media Center 430 CD/DVD/MP3/40 gigabyte hard drive with 28 GB available storage touchscreen radio, Uconnect handsfree phone, iPod connector, fog lamps, bright exterior mirrors and door handles, 18-inch aluminum wheels, express up/down key fob, remote start and windscreen. In addition to the standard features available on the Limited model, the 2012 Chrysler 200 S model offers: Premium Boston Acoustic speakers, “S” heated, leather front seats and leather rear seats with suede inserts, perforated leather-wrapped “S” steering wheel, 18-inch aluminum “S” wheels with black painted pockets, body color mirrors and door handles, “S” Grille with black painted bars, “S” headlamps with black background, “S” fog lamp bezels and a unique Chrysler winged badge with black inlay. The 2012 Chrysler 200 Convertible is available in the following exterior colors: Blackberry Pearl Coat, Bright Silver Metallic, Black Clear Coat, Deep Cherry Red Crystal Pearl Coat, Bright White Clear Coat, Crystal Blue Pearl Coat, Deep Auburn Metallic and Tungsten Silver Metallic. The 2012 Chrysler 200 Convertible will begin arriving in U.S. dealerships in September 2011. 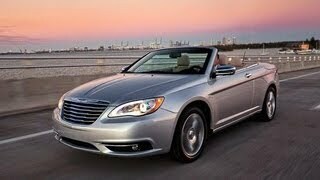 The Chrysler 200 Convertible and sedan are built at the Sterling Heights, Mich. Assembly Plant.